SaharaReporters is confidently projecting Muhammadu Buhari of the All Progressives Congress (APC) as the winner of last weekend’s presidential election based on collated poll results from 95 percent of Nigeria’s polling units. The Independent National Electoral Commission (INEC) will resume the official release of the poll figures at 10 a.m. Nigerian time today, with Mr. Buhari all but certain to be declared the president-elect. Last night, INEC suspended the official release of the state-by-state vote counts for the keenly contested presidential election. However, with only five percent of votes remaining to be added up, our figures indicate that Mr. Buhari is leading incumbent President Goodluck Jonathan by more than two million votes. In addition, the APC candidate has secured at least twenty-five percent of votes cast in two-thirds of Nigeria’s 36 states. Mr. Buhari has so far won 14,855,820 million votes, with Mr. Jonathan trailing him with 12,107,628 million. Our analysis, based on collated votes that were already announced in different states, shows that there is no statistical pathway open to Mr. Jonathan to surmount his vote deficit with very few polling units left to account for. INEC’s formal declaration of Mr. Buhari as the winner of the presidential election will represent a historic moment in Nigeria’s history, being the first time that an opposition candidate would unseat an incumbent head of government at the federal level. Another historic aspect is the fact that Mr. Buhari finally triumphed on his fifth run as a presidential candidate of one of Nigeria’s parties. As Nigerians awaits the final result of the 2015 presidential elections to be announced by INEC, a new video has surfaced online which exposed an official of the Independent National Electoral Commission colluding with supporters of the Peoples Democratic Party in the area to rig the presidential and national assembly election in favour of the party. The ugly incident happened in Polling Units 009, 010 and 011 at Oniong West Ward 1, Onna Local Government Area, Ikot Eko Ibon village of Akwa Ibom State with full glare of the villagers. The video was released online by news website, PREMIUM TIMES. Muhammadu Buhari, the presidential candidate of the All Progressives Congress (APC), continues to lead incumbent President Goodluck Jonathan of the Peoples Democratic Party (PDP) with a comfortable margin, even as controversial election results from Rivers and Akwa Ibom states were added to the national tally, giving a boost to Mr. Jonathan. Election observers as well as Governor Rotimi Amaechi of Rivers State had declared that last Saturday’s elections in the state turned into a fiasco, marked by intimidation and shootings of APC members and widespread manipulation by security agents. Even so, the Independent National Electoral Commission in the state declared that Mr. Jonathan polled more than 1.48 million in the state, leaving Mr. Buhari with a little more than 69,000 votes. Despite this figure and results from Akwa Ibom that gave the incumbent president 953,304 votes, the APC presidential candidate maintains his lead. Two sources told SaharaReporters that several top APC politicians have already arrived in Abuja in preparation to declare victory in the presidential polls. The delay in announcing polling results from the South South and South East zones had caused apprehension within the country and heightened allegations that President Jonathan’s associates were surreptitiously attempting to inflate the incumbent president’s vote tally from the two zones. The Independent National Electoral Commission (INEC) on Monday evening established a fact-finding mission of three National Electoral Commissioners into the allegations of the All Progressives Congress (APC) on the conduct of the Presidential and National Assembly elections in Rivers State. Citing irregularities, the party has called for the election in Rivers to be cancelled. A statement by INEC Secretary Augusta Ogakwu said the panel would advise the Commission and the Chief Electoral Commissioner/Returning Officer for the Presidential election on APC’s allegations. The committee comprises Mrs. Thelma Iremirem, Head and supervisory National Commissioner for Rivers State, Col. M.K Hammanga, and Professor Lai Olurode. They are expected to submit their report before the end of the collation of results of the other States and the FCT, Mrs. Ogakwu said, adding that following the consideration of the report, INEC will make its decision known. The United States and United Kingdom governments have issued a joint statement expressing concern over political interference in Nigeria’s presidential elections held last Saturday across the country. The joint statement, signed by US Secretary of State John Kerry and UK Foreign Secretary Philip Hammond, also expressed satisfaction with what it described as the largely peaceful atmosphere that marked the polls. “Our governments welcome the largely peaceful vote on March 28. The Nigerian people have shown a commendable determination to register their vote and choose their leaders. “So far, we have seen no evidence of systemic manipulation of the process. But there are disturbing indications that the collation process—where the votes are finally counted—may be subject to deliberate political interference. This would contravene the letter and spirit of the Abuja Accord, to which both major parties committed themselves. The Independent National Electoral Commission (INEC) is holding a press conference in Abuja. The official announcement of the results is happening now. Independent National Electoral Commission (INEC), has approved the manual accreditation of voters for the elections. As a result of the problems and hitches with the accreditation process via Card Readers, the electoral body has therefore stated in polling units where the technology fails to work, the Presiding Officer shall manually accredit voters. At Ejigbo, Lagos State, as we speak. At Polling Unit: Ward 022, the Accreditation has been done, and now, being the time for voting, the Corpers and Policemen were OPENLY bribed and the Ballot Box is no longer at the Polling Unit. The Corpers have been taken to a nearby hotel and we the voters have been barred. People are now leaving out of fear and frustration. A member of Gombe State House of Assembly, Alhaji Umar Aminu (APC), and eight others are feared killed by insurgents on Saturday. The insurgents who attacked Dukku and Nafada local government areas of the state were said to have killed the lawmaker representing Dukku South Constituency. A source told newsmen that the insurgents, who came from Yobe, initially attacked Shole, Birin Bolewa and Birin Fulani towns of Nafada and later attacked Dukku. There was confusion in the two areas as some voters left the polling units but others later returned to be accredited, the source said. According to the source, the insurgents killed three persons in Nafada Local Government Area, including a policeman and killed six persons in Dukku Local Government Area, including the legislator. The source further said the insurgents left on the Dukku-Darazo road after the attack. DSP Fwaje Atajiri, the Police Public Relations Officer (PPRO) in the state, confirmed the report, adding that details of the incident would be given after investigations were completed. “There was an attack on the outskirts of Nafada in attempt to disrupt the elections. A joint team of military and policemen promptly moved to Dukku and pushed the insurgents to the bush,” he said. Atajiri said elections were going on in the area and other areas of the state as the Special Forces were in control of the situation. Reacting to the death of his colleague, member representing Akko North Constituency at the State House of Assembly, Alhaji Gidado Lawanti, described his death as unfortunate. He described the deceased legislator as a friendly and nice person who went along with everybody. Lawanti prayed for the repose of the soul of the deceased. Aminu was fielded to re-contest the state assembly election on April 11. PDP and APC supporters clashed during accreditation in Ekiti state….. 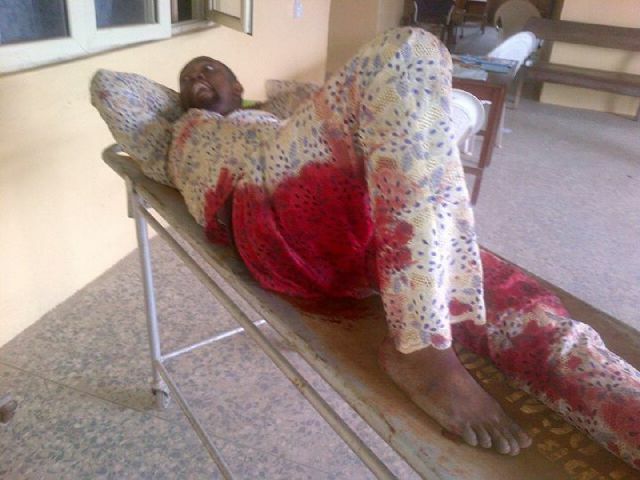 According to eye witness, the man was shot at Ikere Ekiti.